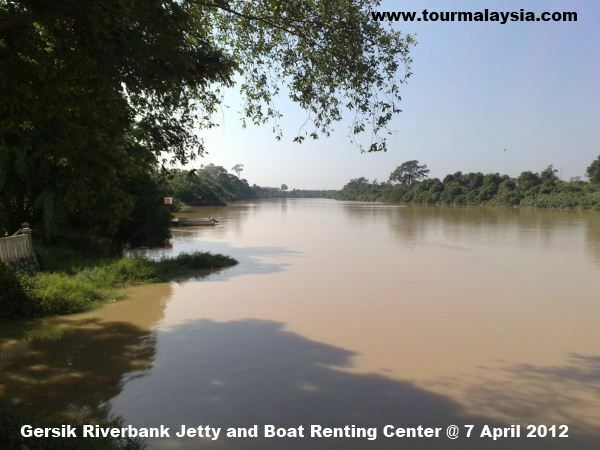 There are several boat renting facilities along the Muar river’s middle and upper stream from Bukit Pasir to Bukit Kepong. The stretch of Muar River is abundant with fresh water prawns (udang galah) during the harvest season. This is one of the boat renting centers (not sure it’s legal registered with ROC and marine police) at Gersik Town. The boat renting center in Gersik is operated by a Malay businessman and their contact is listed on the banner at the wooden jetty. Usually, advance booking for boat is not needed. A Malay youth from Kelantan drown during the prawning trip in Muar river at Gersik. He dived into the river to search for his lost wallet, and he was found missing afterward by his girlfriend. His body was found later in the river. Take care your safety in the river even you know how to swim.